Place pork shoulder in slow cooker. Pour sauce over pork (no need to add water), cover, and cook on low for 7-8 hours. Remove pork to a medium bowl and shred using two forks. Return pulled pork to slow cooker and continue to cook on low for another 30 minutes to allow pork to soak up sauce. Heat tortillas a bit so they are warm and pliable. You can do this in the oven wrapped in foil or in microwave (wrapped in a damp paper towel), or here’s my favorite method: heat a cast iron skillet or other heavy-bottom nonstick skillet over medium-high heat. Cook tortilla on each side for about 30 seconds until tortillas puff and char a bit. 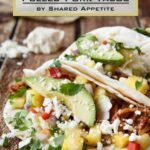 Top each tortilla with pulled pork, pineapple habanero salsa, tangy cabbage slaw, and a sprinkle of cilantro and queso fresco. Eat immediately. Combine coleslaw mix, scallions, apple cider vinegar, olive oil, and sugar in a medium mixing bowl. Season with Kosher salt and freshly ground pepper and allow to sit for at least 20-30 minutes for flavors to meld.